Planting Vegetables – Are Seeds or Starts the Best for Your Garden? >> Planting Vegetables – Are Seeds or Starts the Best for Your Garden? Winter will be winding down soon and you’re starting to think about for spring. Your garden is calling you and you can’t wait to get your hands in the dirt. But what’s the best way to plant it? 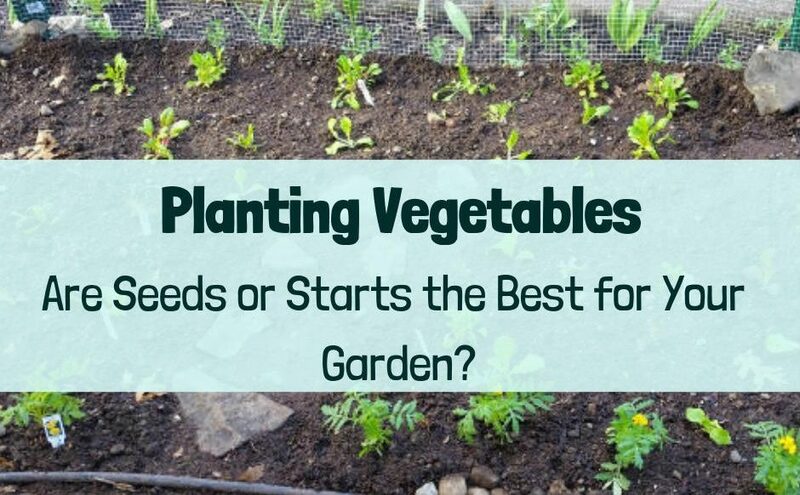 Direct seeding your vegetables is one option, but transplanting vegetable starts is another. Which do you choose? Keep reading to get the pros and cons of both methods so you can get your garden off to a great start. You can have a fabulous garden whether you choose direct seeding your vegetables or transplanting vegetable starts—it all comes down to your priorities. Each method has its pros and cons. But before diving into those, let’s just make sure we are on the same page when it comes to what direct seeding and transplanting actually means. is when you plant your seeds directly into the garden. You don’t start them first indoors or in a separate greenhouse. But you can use season extenders like cold frames to give your seeds a head start. (which are young plants, generally no more than 6” tall) involves either buying the starts or starting your own starts inside. In both cases the starts will be in small pots. Once the plants are ready and the weather is right, you transplant the vegetable starts into your garden. Okay—now let’s dive into the pros and cons of direct seeding your vegetables versus transplanting vegetable starts. But don’t worry about taking notes—I’ve made a free, easy-to-print cheat-sheet that quickly outlines all the key points of this post. This patch of orach was direct seeded in my garden last year. "Greens" like orach tend to do great when direct seeded. Let’s start with direct seeding. Direct seeding your vegetables is a very simple way to get your garden planted. It’s also the cheapest way to plant a lot of vegetables. Plus, you have the added advantage that if you let your vegetables go to seed and save that seed, you can essentially plant the following year for free. Though this can also be done with transplants. If you are interested in learning more about saving your vegetable seeds, make sure to check out the great book Seed to Seed: Seed Saving and Growing Techniques for Vegetable Gardeners, 2nd Edition. All you need to do for direct seeding your vegetables is to follow the instructions for the specific seed you are planting and plant the seed into your garden. Over the next week or 2 your seedlings will come up and your garden well be on its way. Direct seeded plants tend to have much longer roots than transplants. These plants were pulled in order to thin a planted patch. Even though these plants have yet to get full leaves they have roots already longer than small starts. As mentioned earlier, a big pro of direct seeding is that it is cheap and easy. In addition, young seedlings develop much bigger roots than transplanted starts. Even a young seedling with just the first 2 false leaves (also known as cotyledons or seed leaves) can have a root that already goes deeper into the soil than an average transplant. This will make your vegetables much more resistant to drought and reduce how much water your garden needs—which is great if you want a low water garden! Direct seeding also gives you a higher chance that some of the vegetables will do well. Say you’re seeding lettuce—you will likely spread a lot more seeds than starts if you had gone the transplanting route. Why is this a pro? Because when you thin your new seedlings (often viewed as a con of direct seeding your vegetables) you are selecting for those individual plants that are doing the best in your garden. You often don’t get to do this with transplants. Direct seeding your vegetables also means you don’t need to take up space growing starts indoors or in a greenhouse. Depending on how your homestead is setup, you may not have room to grow your own starts. If you save seeds, the next year is free! Great root systems, which makes plants more drought resistant or need less watering. The most resilient in the long-term, since you can select the seeds that do the best in your specific growing conditions. Doesn’t require extra space for growing starts. While direct seeding can work great if you're not careful you can have too many plants coming up. This means you need to thin the plants which takes time. Are you sold on direct seeding? Well, before you go out and buy a bunch of seeds, there are some drawbacks you should consider. A big con of direct seeding is that if you live in an area with cool and wet springs like I do here in western Washington, it can be hard to get warm-loving plants like tomatoes started early enough to still get a harvest before the cool late summer and fall weather sets in. Not all vegetables need hot weather, but for those that do, direct seeding does not always work—at least not with store-bought varieties that have not been adapted to your local conditions (Saving seeds can help solve this problem!). Another problem is that thinning direct-seeded vegetables can be time consuming—especially for those vegetables with small seeds like lettuce. The solution to the problems with thinning is to be more careful about spacing the seeds, but this is not always easy to do. I have also found that, at least in the early days of getting a garden set up, pests like slugs and pill bugs can quickly eat through young seedlings. Larger transplanted vegetables can handle this a bit more readily. But if you work with nature, your garden will eventually reach a balance with these pest, so this issue may go away over time. The other con with direct seeding your vegetables is that it can be challenging if you use a thick mulch. While you can move the mulch aside, depending on how thick your mulch is, that can be tricky. Most vegetable seedlings won’t come up through a thick mulch. More vulnerable early on. These plants are so small when they first come in that they can be an easy target for pests like slugs and pill bugs. Less growing options in climates with shorter growing seasons (Many heat-loving plants won’t get a chance to take off before the cool weather returns.). Thinning the surplus seedlings can be time-consuming. Challenging if you use thick mulch (The mulch needs to be pushed aside, since most seedlings won’t be able to grow through it.). Vegetable starts are often used by gardeners. But this method is not appropriate for all types of vegetables. So what about transplanting vegetable starts? In a lot of ways, I really like transplanting starts into my garden. It is just so fun to transform a bare garden in just a single day. One moment you have bare earth—the next, the garden is filled with vegetables. But of course, there are some tradeoffs. Here’s how it shakes out. It is really fun taking a bare garden and instantly turning it into fully planted garden by transplanting vegetable starts. Transplanted vegetables are more resilient to pests like slugs and pill bugs from day 1. That’s because the plants are already a decent size the moment they set root in your garden. It’s also easier to see where all the new vegetables are, which can be helpful in a large garden. Regardless of whether you buy vegetable starts or grow them yourself, you can give your heat-loving vegetables a head start. This is less of a benefit for cool weather vegetables, but in some cases it can still help. And if you buy your vegetable starts, it’s also a lot faster—you can buy and transplant the starts all in the same day. More resilient to pill bugs and slugs (because they’re a decent size from Day 1.). Easy to spot the new vegetables. Expands your growing options (you can give your heat-loving vegetables a head-start.). If you grow them from seed: You can save seeds and get some of the same plant selection-benefits of direct-seeding. While vegetable starts can be a great way to get a garden going they do have some downsides. For one they can be expensive if but they also take up a lot of space if you are growing them yourself. One of the biggest cons of transplanting vegetable starts is that you either need the space to get them started indoors or in a greenhouse, or you need to buy them. Buying them can get very expensive if you have a large garden. But growing vegetables starts yourself requires pots or soil blocks, trays, good soil for starting vegetables (homemade or bought), space, and possibly grow lights. This all takes money, or if you take the DIY route it can take time (building soil, etc.). Of course, direct seeding also takes time because of the issues with thinning the plants. But doing your own starts is still the most time-consuming option. If you do go the route of growing your own vegetable starts, I recommend looking into getting a soil block maker so you can eliminate the need for wasteful plastic pots. (Here’s a recipe for a DIY soil block maker soil). While transplanted vegetables can have a head start over direct-seeded vegetables, they won’t have as good of a root system. This means transplanted vegetables will need more water than direct-seeded vegetables. Sometimes, directed seeded vegetables will even catch up to transplanted vegetables because of this difference in root size. And since transplanted vegetables tend to have poor root systems, I’m sure you can imagine what this means for the miserable transplanted carrot (Or radish, or potato, or any other root crop where the part you eat grows underground. Just don’t try it). Also, as mentioned earlier, transplanting vegetable starts won’t let you select those plants that do best in your specific growing conditions. But you can save seeds from your transplants, so if you grow your own starts, then over time you can still get locally-adapted varieties. That said, direct seeding still provides a better benefit in this area. Finally, I’ve also noticed that cool weather vegetables like spinach tend to bolt (go to seed) faster when transplanted than when grown from seed. Poor root systems, which can slow their growth and make them thirsty and vulnerable to drought. Root crops like carrots, beets and potatoes do poorly when transplanted. Some cool-weather vegetables go to seed faster when transplanted. Can’t typically select plants that are adapted (landrace) to your own growing conditions. If you buy them: This can get very expensive! If you grow them from seed: You need a lot of space, access to good soil, and possibly special equipment. This can also get expensive, and it can be very time-consuming. You can have a nice and productive vegetable garden using either method. Both have their pros and cons so choose the one that is right for you and your garden. I like a mix of the 2 methods depending on what I'm growing. So, what is the better choice between direct seeding your vegetables and transplanting vegetable starts? If your goal is to have the most options for what to grow, you’ll want to do transplants. And if you want to save time, you’ll need to buy them. If your goal is to save money, or to have the most robust and resilient garden in the long-term, then direct seeding is your best bet. A lot of people do some combination of each. I always direct-seed peas and beans, which naturally do well in my climate, but I tend to plant tomato starts. I’d love to start direct-seeding tomatoes, but space is always an issue. At some point I plan to build a greenhouse or cold frame that I could use for direct seeding, but for now I rely on transplants. And I don’t have the time or space to grow my own starts right now, so buying is my only real option. Because of this, I’m focusing on direct seeding for most of my vegetables and buying starts for plants like tomatoes, basil, peppers, eggplants, etc. It’s also true that some vegetables don’t do well as transplants, like carrots and other root crops. These plants make the choice for you! Think about your situation and the vegetables you are planting. If you’re like me, you may prefer a mix of direct seeding your vegetables and transplanting vegetable starts. Please leave a comment below sharing which option you prefer or if you prefer a mix. Also, don’t forget to grab the free, easy-to-print cheat-sheet which will help you decide which option is right for you. We were just talking about this the other day when we had a chance to work outside on clearing grass. Seems like the right time of year for this topic! One of my co-workers was asking me about this which inspired me to write this post. Have you made a decision which method to use?